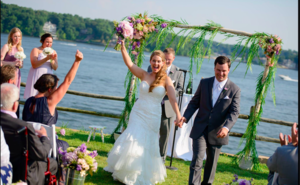 The Lodge of Four Seasons is the most elegant destination wedding location at the Lake of the Ozarks and offers you beautiful scenery, accommodations, and memories that will make you smile in the years to come. Whether you prefer an intimate exchange of vows overlooking spectacular Lake of the Ozarks or an extravagant celebration with 300 of your closest friends, and family, we offer the perfect space to host your special day. The Lodge offers 6 separate outdoor locations to choose from for your celebration, all with panoramic views of The Lake of the Ozarks. However, we know Missouri weather can be unpredictable. Our Sales team will put your mind at ease and ensure an appropriately sized indoor backup location is reserved free of charge just in case of inclement weather. Unique to The Lodge, our two onsite Wedding Coordinators are here to assist all current and potential brides. From the initial contact, booking and planning, to the moment you walk down the aisle, our team will work with and for you to make your dream wedding a reality. Call today, ask to speak to a wedding coordinator, and begin the process of making your wedding dreams come true here at The Lodge of Four Seasons!